* Note: Rigatoni are big tubes of pasta that have a ridged outside and smooth inside. The ridges help the pasta hold heartier, thicker sauces, making this the ideal pasta for this recipe. Place ground beef in medium mixing bowl. Add Kosher salt and pepper. Using clean hands, gently work salt and pepper into the meat. Do not over mix the meat as it will break down the fat. The flavor is in the fat! Fill large pot with half gallon of water, bring to a boil, then add 1-1/2 tsp of salt. Add rigatoni and cook for 8 minutes. You want the pasta to be cooked al dente. While the pasta is boiling, warm medium sized skillet on medium to medium-high heat, add butter and the fresh ground beef. Cook for 8-10 minutes, stirring and breaking up beef as it cooks. Drain beef and butter. Once pasta is finished boiling, drain rigatoni, reserving 1 cup of the cooking liquid. 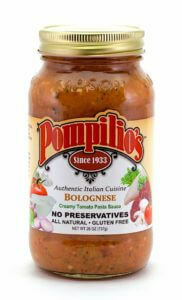 Add Pompilio’s Bolognese sauce to sauteed beef and the reserved pasta water. Once sauce is warm, add rigatoni and let cook in sauce for 4 minutes until al dente.